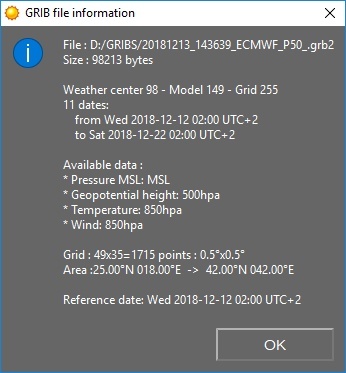 So it is normal to have only Pressure available as data for these gribs in xygrib direct download? Hi Philippe and welcome to the forum. To get a bit more than surface pressure one needs to select altitude data for 850mb and 500mb. This adds wind and temp for 850mb and geopotential height for 500mb as shown in the info dialog below. As a long retired professional meteorologist, a sailor and a cynic, I do have to question the real value of the ECMWF forecasts over and above GFS and ICON. I am well aware that ECMWF out-performs the rest, slightly better than the U.K. and a little more so than GFS and ICON. But, when I look at www.weathercast.co.uk/services/ensemble-forecast.html , I see very little consistent differences. Such differences as there are, are well within the natural uncertainty, noise if you like, in the weather. There are limits to predictability and that basic fact is not appreciated by the vast majority of the public, even the more meteorologically aware. As a sailor, I see no point in using Predictwind to get ECMWF output. You are doing a great job, David.